Fridaaaay – and as promised, a new recipe (each week) between now and the new year. This is my perfect Christmas salad to go with the tried and true roast side of salmon with pomegranate glaze and quick pickled red onions – the combinations are so bloody brilliant. 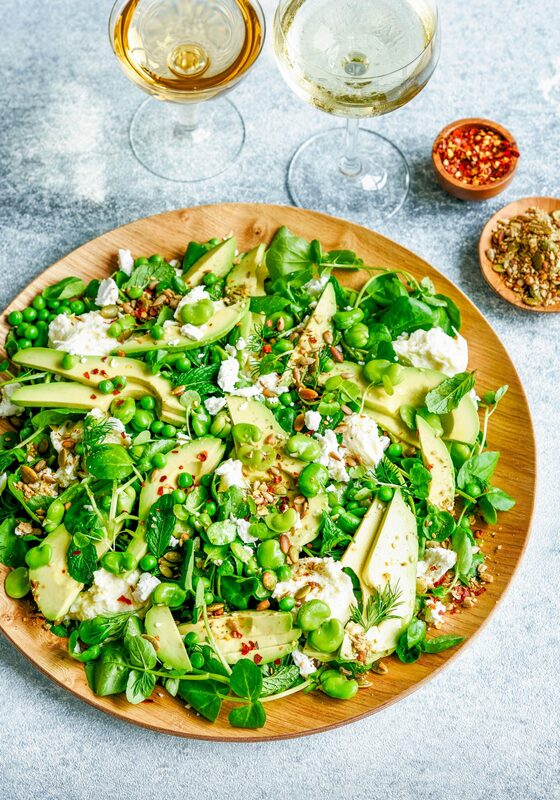 The salad is loaded with fresh bright peas and broad beans, creamy avocado and milky mozzarella, peppery watercress and salty feta – all finished off with the zing of mint and lemon zest, a bit of chilli grunt, and nutty, aromatic dukkah. Seriously, it is my favourite! 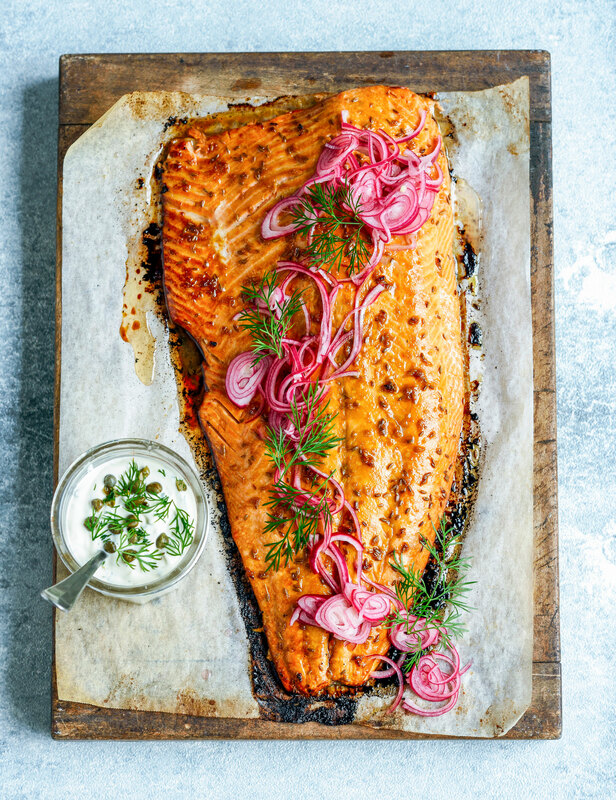 I originally put the recipe together for Dish magazine, and if you are thinking about making the salmon for Christmas (so easy and popular), this is the salad for you. And in other news, as mentioned yesterday I occasionally question my sanity when organising things – I always think ‘yep, yep I can do that!’, and so I do…but at some point I will have a moment of ‘what the bloody hell was I thinking? So tomorrow night I have my 50th birthday party here – and from a foodie perspective I thought I’d share the menu: oysters natural (served simply on ice with lemon), crostini two ways – with chicken & fennel salad or simple tomatoes, olive oil & basil, olive and semi-dried tomato arancini with aioli and a few massive antipasto platters loaded with prosciutto and other cured meats, mozzarella, grilled asparagus, olives, hummus and fresh Italian breads. Drinks will be negronis and aperol spritzes (classic recipes from my book). Later in the evening I have artisan pizzas being delivered – cos quite frankly at some stage I just want to have a few drinks and a boogie and not be in the kitchen! Anyhoo, so that’s the plan…I’ll let you know how it goes. Finally – gah – missing my babies…it was so fabulous having them here. Henry is now hard at work in Melbourne at a tiny house building workshop, while Rich is flat out with his job in Welly. If you fancy seeing their Christmas wish lists for inspo for your own menfolk, you can find it here. Right, needless to say you won’t hear from me again until after the weekend – but check back next Wednesday for another new recipe…see you then. Bring a medium pot of water to boil and fill a sink with cold water. Drop the broad beans into the water and cook just until the water comes back up to the boil. Drain and put straight into the cold water with a few ice cubes. Gently pop the beans from their pods and refrigerate to keep fresh. Boil a second lot of water and drop in the peas for 1 minute, then drain and refresh under cold running water. Add to the beans with a few sprigs of mint (remove before serving) and refrigerate in a covered container. Whisk together the olive oil, lemon juice, sugar, salt and pepper. To serve layer onto a platter, first the watercress, then avocado, mozzarella, beans and peas, feta, remaining mint and dill. Drizzle with lemon dressing and sprinkle with dukkah and chilli flakes. Cheers to celebrations and feasting. Wishing you many more in years to come! The feast looks amazing. Hello, love the look of this but confused by the oil quantity, can u please clarify?